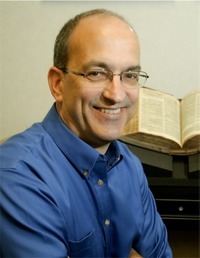 Today’s interview is with George Guthrie, the Benjamin W. Perry Professor of Bible at Union University in Jackson, TN. Guthrie received the Ph.D. and the M.Div. degrees from Southwestern Baptist Theological Seminary and a Th.M. from Trinity Evangelical Divinity School. He is the author of numerous articles and seven books, including, The Structure of Hebrews: A Textlinguistic Analysis (Supplements to Novum Testamentum, 73. Leiden: E. J. Brill, 1994; republished by Baker Books in 1998), Biblical Greek Exegesis (Co-authored with J. Scott Duvall, Zondervan), the NIV Application Commentary: Hebrews, and Illustrated Bible Backgrounds Commentary: Hebrews (read more). I personally benefited from Guthrie’s work in Hebrews recently during a PhD seminar in which I did work in that fascinating book. He also maintains a website, GeorgeGuthrie.com, where you can find a number of helpful resources and information about recent projects. Thank you, George Gurthrie, for taking time to respond to a few questions! The world of academia and the world of the local church certainly are distinct, but I understand them as profoundly integrated in my own life. I believe scholarly work on the Bible best done in the context of Christian community and for Christian community—to advance the cause of Christ in the world. So much of biblical studies work is secular. Indeed, many biblical scholars believe there must be a strict separation between “objective research,” so-called, and “faith” (which often is a modern, existentialist understanding of “faith,” rather than a biblical understanding). Yet, “objective research” unaffected by one’s worldview is a pipe dream. We all have a “pre-understanding” that affects our work. I believe Jesus Christ really is Lord of the universe, and that will affect my work. As a follower of Christ, his lordship makes certain demands on my work. Truth, integrity, excellence, and the purpose of the work—a purpose that goes far beyond the advancement of my own career—all should drive me. But I also see myself as a part of the Church. My work is both an extension of Christian ministry of the Church and work done in service to the local church. The university where I teach serves local churches and is a ministry of those churches. At the same time, I have found it a wonderful balance to move back and forth between the classroom and ministry in the local church. The latter keeps my feet on the ground and informs my classroom teaching. My academic work, on the other hand, provides a foundation for ministry in the church and grounds that work solidly in the Scriptures and theology. I first sensed a “call” to vocational ministry as a freshman at university. Yet, though I was willing, I did not think I would be a pastor of a local church. Then, in my Junior year at the university, a professor, Bob Agee, used the book Evangelism in the Early Church by Michael Green in a class. Green combined a passion for the church with wonderful academic rigor on the study of early Christianity. I approached Bob after class one day and said, “I think this is what I am supposed to do in life.” Later, it became even more clear to me that I needed to focus on New Testament Studies. But it seems there was just enough “light” for the path to guide me in the decisions that had to be made at each stage of the journey. I said that I did not have a sense I was to be a pastor. Yet, when I came to Union University to teach in 1990, there were friends from my university days who were about to plant a church in the area. They informed me that it was God’s will for me and my wife, Pat, to be involved! After praying about it, we agreed. I was a co-pastor in the church for 10 years. I now am more a “minister at large” for that church, trying to help other churches learn how to train their people to read and study the Bible more effectively (see www.readthebibleforlife.com). As noted in the previous answer, my “calling” has grown out of following the Lord step-by-step through life. At one point while in seminary, Pat and I thought we were heading for international missions, perhaps in East Asia. Yet, when Union University leaders contacted me and offered me a position, it very much seemed the right place for us to be. I taught and almost immediately became chairman of the Christian Studies Department, a position I held for 12 years. There seemed to be a strong sense of confirmation on our ministry here, and I started almost immediately having opportunities to write as well. The combination of teaching/mentoring university students and writing has been a very fulfilling ministry. I got completely out of administration in the summer of 2005 and have just been teaching and writing since that time. Through the years I have had numerous invitations to interview elsewhere, most often on the graduate level, but, with the exception of one instance, I had a clear sense almost immediately I needed to stay at Union. It really is a wonderful place to be and has gotten better and better through the years. I love my students, my colleagues, and my work. It seems to “fit” me; I have been productive in it. So the fruitfulness has seemed a confirmation of “calling” in a sense. As noted above, that chasm often grows out of a false dichotomy between “faith” and “academic research.” I think it is bridged by understanding Christ as Lord of all aspects of life. Academic work by a Christian should be done as a living out of the lordship of Christ, following him into the details of our scholarly endeavors. At the same time, church life and ministry should be grounded in solid study of the Scriptures, theology, church history, etc. So the chasm is bridged in both directions. Christian academics should reach out to their local churches as vital expressions of Christian community, vital to their Christian experience. Local churches should reach out to Christian academics, supporting them in their work, and benefitting from that work. Thus, the work in the academy and the local church can be a profound and satisfying partnership. Thanks Josh for this interview. Dr. Guthrie seems to reaffirm what I have been thinking and saying for some time. It really should not be a question of “either/or” but rather “both/and” with respect to the church and academics. Best wishes to you in your own pursuits in these areas! Take care! Yes, Tom, I agree as well. I do think a real divide exists, though it can be bridged, as Guthrie says, from both sides. Good to hear from you!